Come and meet the namesake of Robert Is Here--the grown-up version of the young boy who started this roadside fruit stand at only six years old. The fresh produce stand has grown with the man, from just selling cucumbers to a one-stop shop for all your fruit and veggie needs. You'll find the typical flavors of oranges and mangoes complemented by exotic tropical fruits you've probably never heard of, such as canistel and jackfruit. 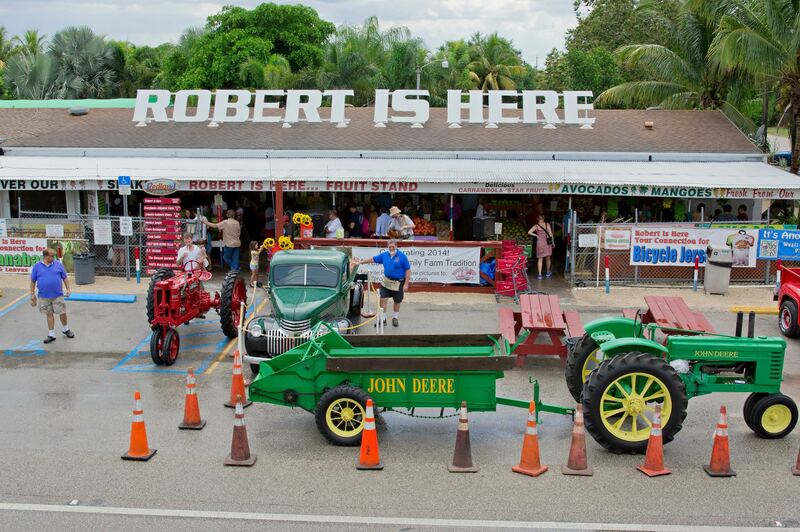 Be sure to try a fresh fruit milkshake (a favorite is key lime) or take home some jam and preserves. Our Homestead day trip planning site makes visiting Robert Is Here and other Homestead attractions simple, and helps you make a travel plan personal to you. I loved this place! I was bringing my mother-in-law today, Labor Day, which says that it is open.... and it is actually closed. I called and the machine said they are only closed for Thanksgiving day and Christmas Day. There has been a lot of people coming to shop, but nothing.... I give a 4 star because I love it! But for today, Labor Day it said open and it’s not. You guys should change the voice machine and the hours for Holidays. Pretty nice place to stop at if you’re in the area. Fresh tropical fruit varieties that are seldom seen in markets. Good local honey selections and delicious fruit milkshakes and smoothies. Very nicely rustic landscaping with a small zoo featuring land tortoises, emus, goats, cows etc. If you’re driving through to the Keys, this a nice place to take a break. Frequently the tropical fruit you can purchase here is ripe and ready when you get it home. But it's always wise to check first with the friendly counter staff for how best to keep and prepare your fruit in order to make the most of it. Dizzying selection of tasty preserves, various honey, assorted pickles. And signage indicates country of origin for their fruits and vegetables. But the real reason everyone goes here, whether they admit it or not, is for the made-to-order tropical fruit shakes and smoothies. My kids are fourth generation customers. We branch out to try shakes in new fruit flavor combinations, but key lime is the rock we return to! Great products and customer service. I visited with my family during weekend and despite it was little crowded, the service was promptly and efficient. Reason I gave not the full rate is because of prices, kind of expensive for average income families, not to mention low income ones. In general, is a nice place to visit and get to know new fruits from the weather of Florida. I came to this place because of all the high reviews and I was not disappointed in terms of quality of goods. Everything we bought tasted very good and was extremely fresh. I really enjoyed how they cut the fruit up for you so you can eat it immediately. My only complaint would be how high the prices were. Otherwise the place is nice and always busy. Every day, we help thousands of travelers plan great vacations. Here are some tips on how to use your Listing Page to attract more travelers to your business - Robert Is Here. Promote your permanent link - https://www.inspirock.com/united-states/homestead/robert-is-here-a397968637 - on your website, your blog, and social media. When a traveler builds a plan from this page, the itinerary automatically includes Robert Is Here. This is a great way for travelers looking for a great vacation in your city or country to also experience Robert Is Here. Promoting your link also lets your audience know that you are featured on a rapidly growing travel site. In addition, the more this page is used, the more we will promote Robert Is Here to other Inspirock users. For best results, use the customized Trip Planning Widget for Robert Is Here on your website. It has all the advantages mentioned above, plus users to your site can conveniently access it directly on your site. Visitors to your site will appreciate you offering them help with planning their vacation. Setting this up takes just a few minutes - Click here for instructions.